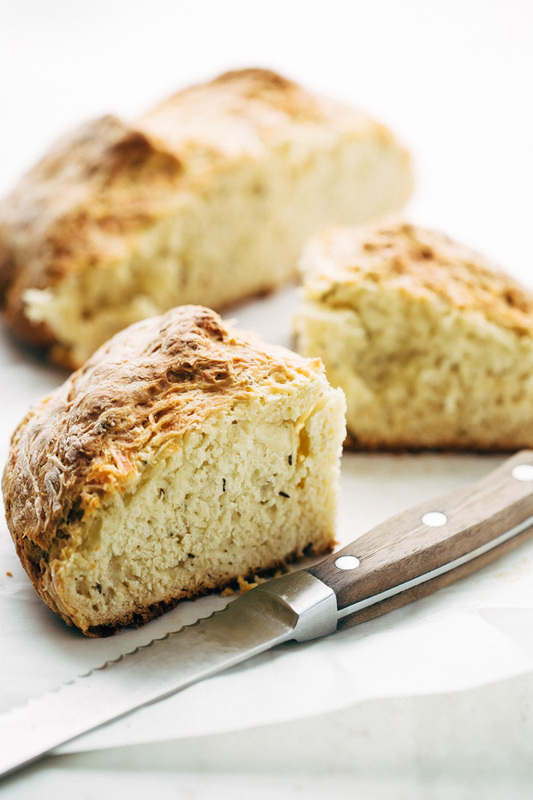 Quick and easy cheddar Irish soda bread speckled with caraway seeds. This bread is chewy, delicious and ready in a flash! 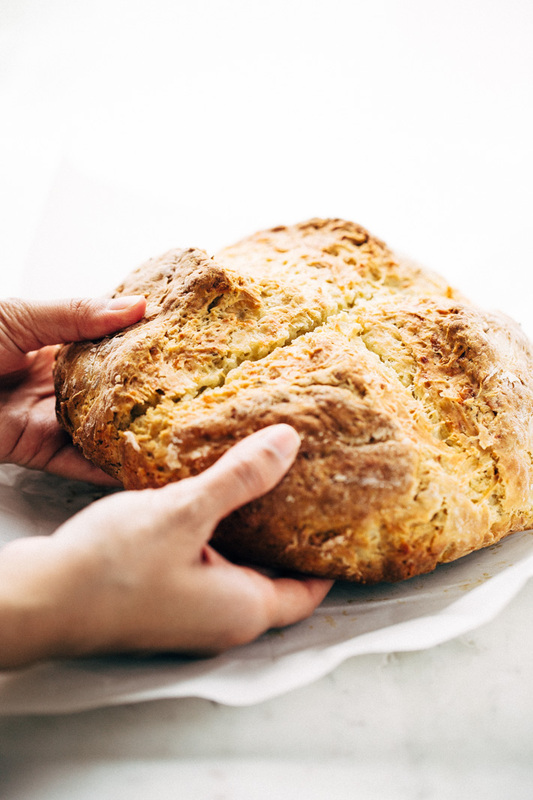 The smell of caraway seeds mingling with pure Irish butter and aged cheddar and forming a golden crust as the dough slowly rises in the oven for the easiest homemade cheddar Irish soda bread. Definitely not great for baking but rainy, cold weather totally adds to the whole ambience. Let there be a big pot of Irish stew or even my homemade beef and barley soup  waiting for you at the end of the rainbow or err, baking time. Because really, what is soup without a nice hunk of cheesy bread to dunk in it? I’m not going to sit here and pretend that making homemade bread didn’t scare the bejesus out of me, because the truth is, up until a few years ago, I wouldn’t be caught dead making homemade bread. The one really big motivating factor besides the potential to carb overload on the softest, pillowy bread? 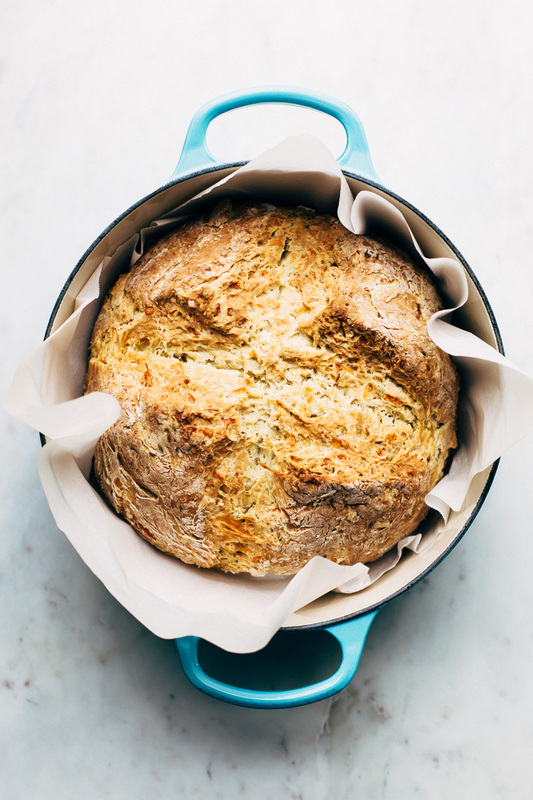 You simply cannot buy the glorious smells that will come wafting out of your oven if you don’t attempt this simple caraway soda bread at home. And though, admittedly i’ll never be Suzy Homemaker that spoils her family with homemade bread every weekend, it’s nice to be able to pull something like this out every once in a while and just enjoy the process and the comfort of homemade bread. 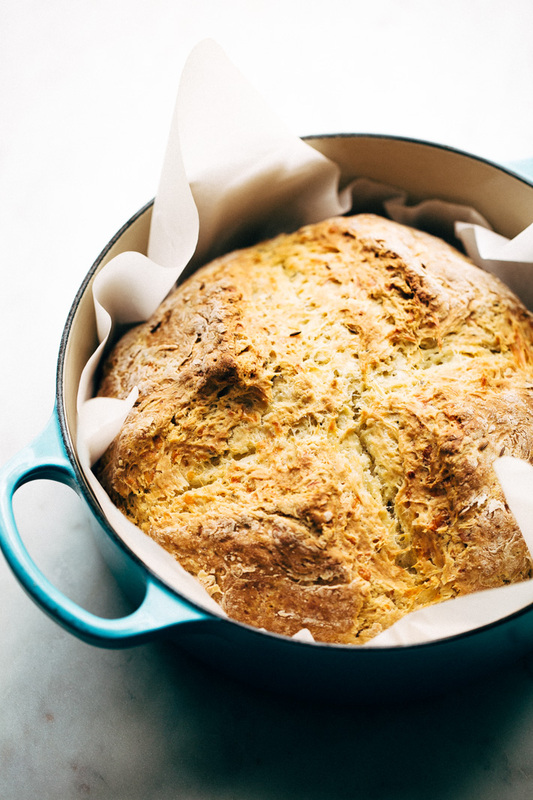 I’ll admit though, I did have an ulterior motive to making this cheddar Irish soda bread. I’ve been feeling a downward slump in the kitchen lately and this was my chance to reset, zero out the timer and start over. Bread has a way of making me whole again. Somewhere between measuring out flour and forming the dough, the worries of the world just seem to fade away. Maybe i’m just in a sugar buzz from all the carby morsels of bread but I can slowly feel myself pulling back to reality and embracing springtime food a little more with each passing moment. What I love most about irish soda bread is that it doesn’t require all the work that comes with making regular yeasty bread. 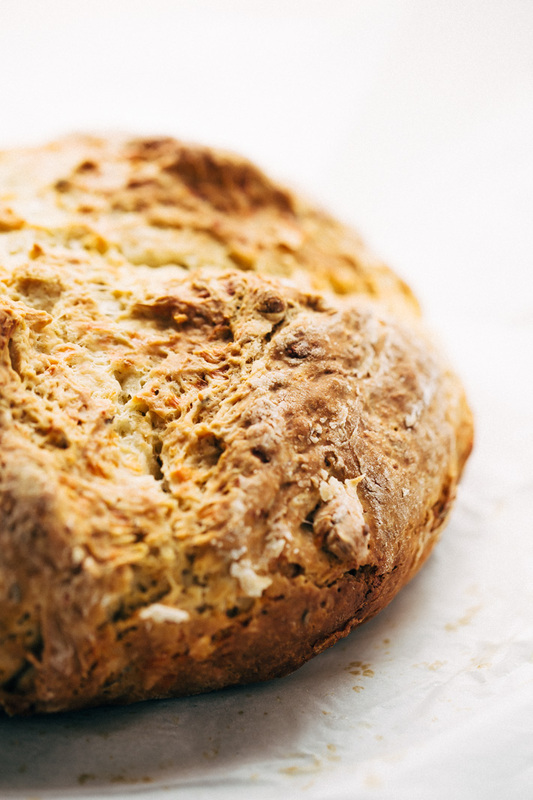 Irish soda bread doesn’t call for yeast so there’s no rolling, kneading, or proofing. It’s as simple as forming the dough and baking it. This soda bread recipe can easily be converted to a more traditional currant or raisins type situation. You can up the sugar a bit to make it a little sweeter too if that’s your thing. Me? 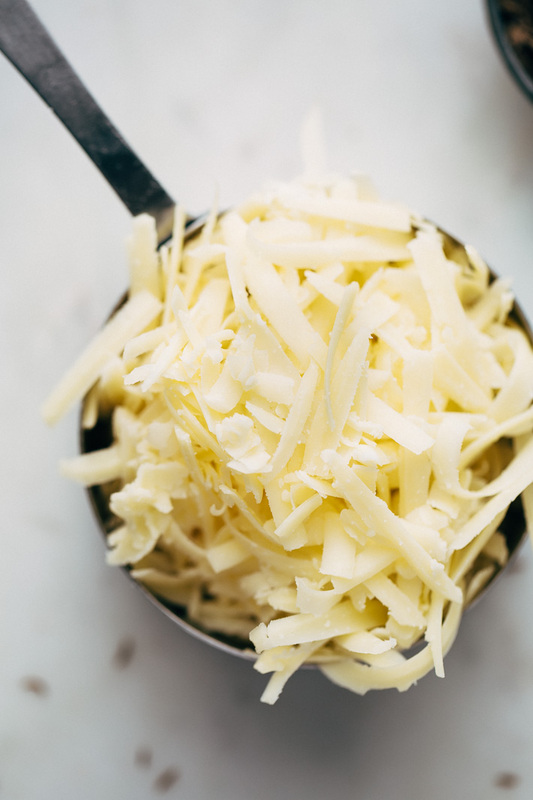 I live for cheese so I swapped a cup of currants for a whole cup of freshly grated aged cheddar cheese. You know those blocks of Irish cheddar that are always in the deli section? THOSE. They make a mean grill cheese sandwich and even better, they taste outstanding in bread. Grilled cheese sandwich with homemade bread? EVEN BETTER. I also speckled my loaf with caraway seeds, the flavor pairs really well with cheddar cheese but again, you can easily leave them out if they aren’t your thing. Next time, I want to play around with herbs. Maybe a little rosemary cheddar bread? or even thyme. A few cracks of black pepper would also really bring some springtime freshness. 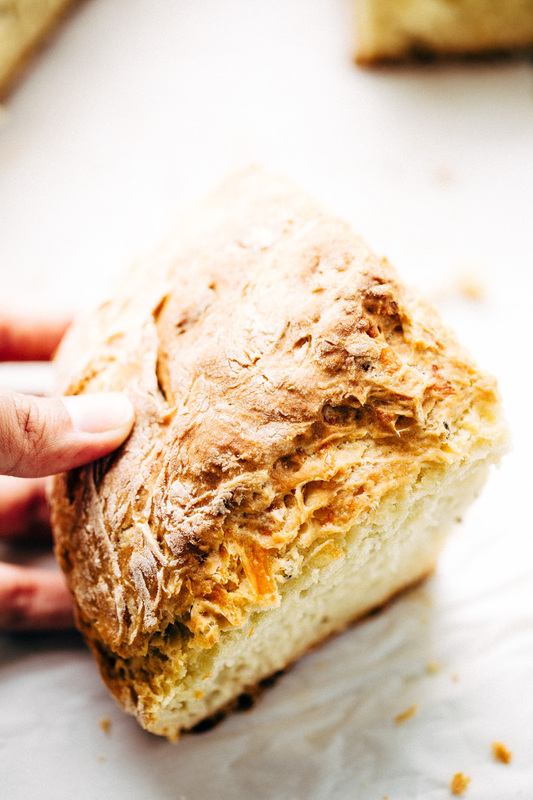 This recipe is like that no-knead crusty bread  I shared some time ago, it’s easily customizable. My bestie and neighbor at the time, added roasted garlic and rosemary and she said she’d never make it any other way. Let’s take a walk through the process. you’re going to combine your dry ingredients along with the shredded Irish cheddar and caraway seeds in a stand mixer and then add the cold butter in small pieces. Allow the butter to blend with the flour and become similar to a coarse meal in texture. If you don’t have a stand mixer, use a pastry cutter, it works just as well. Then, mix in the buttermilk and one egg. It’s important to use buttermilk in this recipe and not regular milk. This might be very obvious but Irish soda bread has baking SODA in it which will react with the buttermilk. You know, all that stuff we learned in science class? Totally kicks in to play here. If you don’t have buttermilk, you can use a few teaspoons of vinegar with regular milk and allow it to stand for 5 minutes before using it in the recipe. Though this will work, I find that store bought buttermilk produces significantly better results. One thing to remember, make sure you don’t overmix the dough, you want it to be shaggy and slightly sticky. I like to bake bread in a dutch oven lined with a sheet of parchment paper but you absolutely don’t have to do this. It’ll work in a cast iron skillet, or even a round 9 or 10 inch baking pan. Anything with sides really as the heat helps brown up the sides better. Before you bake the bread, mark an ‘x’ on the top of the dough. This will help cook the bread more evenly. One ingredient that I always use in my homemade breads that is rarely found in other recipes – dry milk powder. It’s usually sold in the baking aisle right near the condensed and evaporated milk. One to two tablespoons of dry milk powder really adds a more artisan or bakery like quality to baked goods. 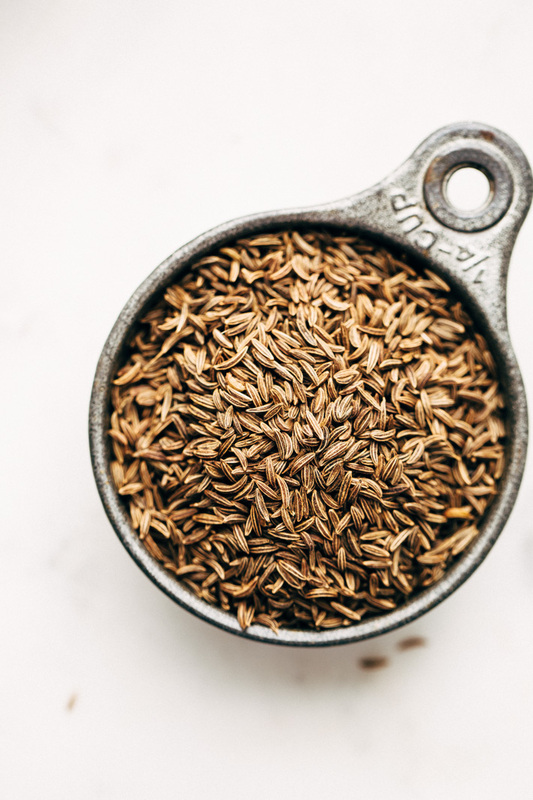 The flavor of breads is so much more delicious with this little ingredients tucked away inside. As we spring forward this weekend let’s make up for that lost hour of sleep by making ourselves a little caraway and cheddar Irish soda bread. Bread really makes everythang better. Position a rack in the center of the oven and preheat the oven to 400ºF. Line a dutch oven, a cast iron skillet, or a 9 inch baking pan with a sheet of parchment paper, set aside. In the bowl of a stand mixer, combine 3 ¾ cups of flour, milk powder, baking soda, baking powder, sugar, salt, caraway seeds, and grated cheddar. Stir using the dough hook for just a few seconds. Add the cold cubes of butter and let the machine break the butter into small pieces so it resembles a coarse meal. You can also do this easily by hand. Stop the mixer until ready to add wet ingredients. In a bowl, whisk together the egg and the buttermilk. With the stand mixer on the ‘stir’ setting, slowly pour in the buttermilk mixture and allow to mix until the dough starts to come together. This should take less than 1 minute. If the dough appears really wet, add an additional ¼ cup of flour. I find this happens more with DIY buttermilk. Continue to bring the dough together using your hands or a wooden spoon. The dough should be shaggy yet slightly tacky. Do not add anymore flour if your bread has reached this texture. If needed add the remaining ¼ cup of flour. Turn the dough out on to a floured surface. Form the dough into a round loaf, working the dough as little as possible. Place the dough on the prepared baking pan and cut an ‘x’ across the top about ¼ of the way through the loaf. This will allow the bread to cook evenly. Bake for 35-45 minutes or until the the bread is golden brown on top. Mine took exactly 37 minutes. Insert a skewer into the center of the bread and if it comes out clean, the bread is done. Let bread cool for 15-20 minutes before slicing into it – that’s IF you can wait that long! DIY buttermilk – add 4 teaspoons of vinegar into a measuring cup and add enough milk to make 1 ½ cups. Let stand for 5-7 minutes before using. Though this will work, I find that store bought buttermilk produces significantly better results. Bread will stay fresh for up to 2 days. Breads that use baking soda for a leavening agent generally dry out much faster than yeasty breads.